When we got this house, we did NOT like the bathroom. It was…well, to use a friend’s favorite adjective…tragic. 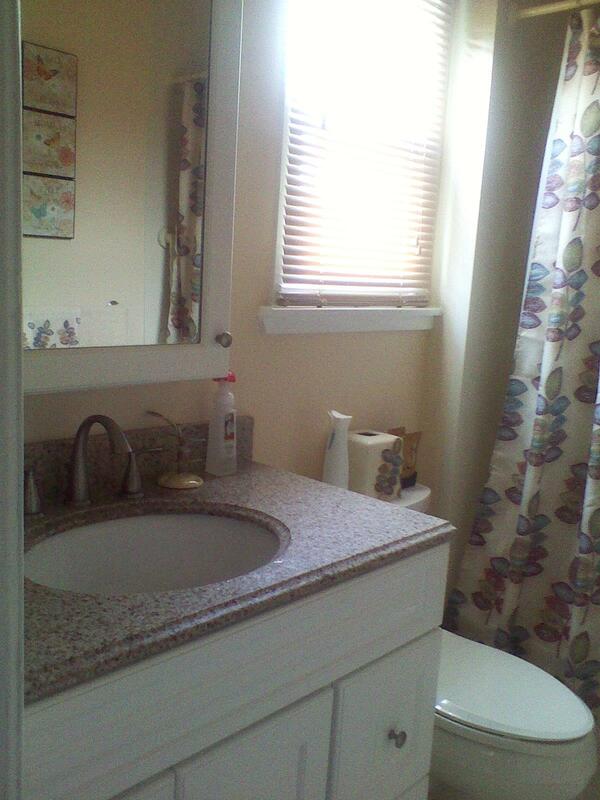 It was as if the Jersey shore exploded in our tiny bathroom. I’m talking beachy-keen wallpaper, and border with very large shells on it. 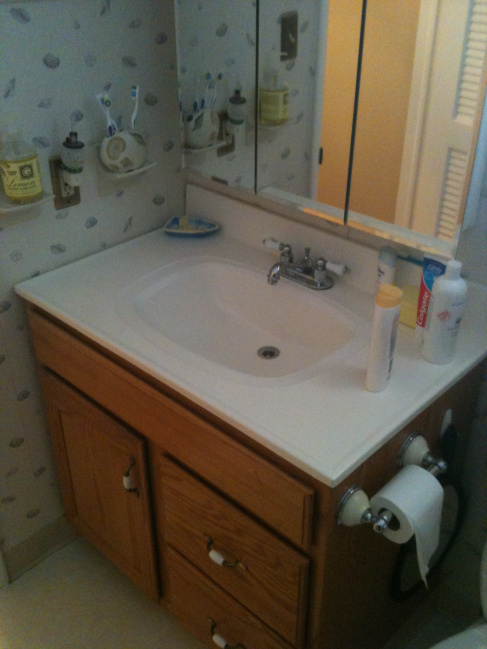 Also included were a dated vanity with bad fixtures and a floor comprised of a sheet of white linoleum with grooved squares. 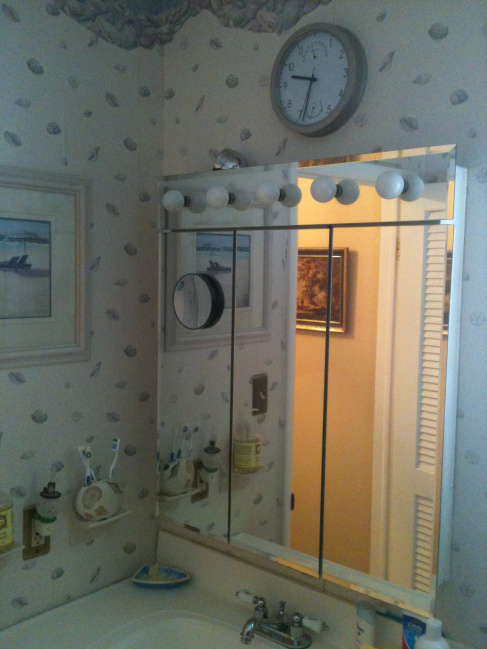 If the wallpaper wasn’t awful enough, it was 4 layers deep with one layer of wallpaper tacked on top of another, from the 60’s up through now. 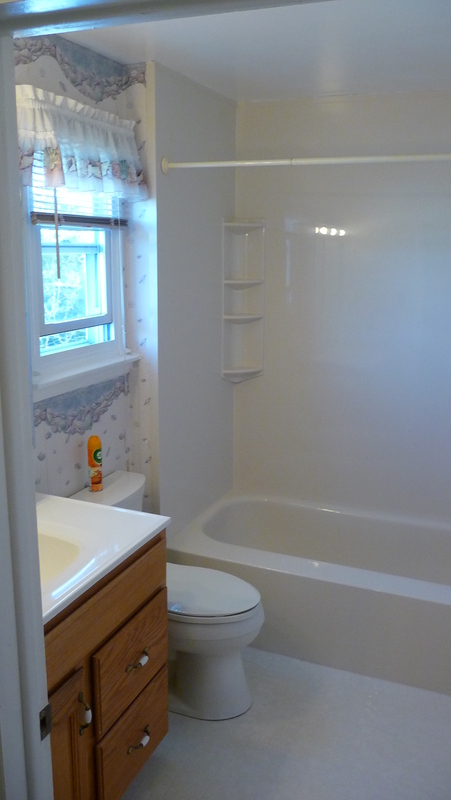 With the shower being the exception, the bathroom ended up being a “gut”. The wallpaper over the years ruined the walls and could not be stripped without taking chunks of 1960’s drywall with it. 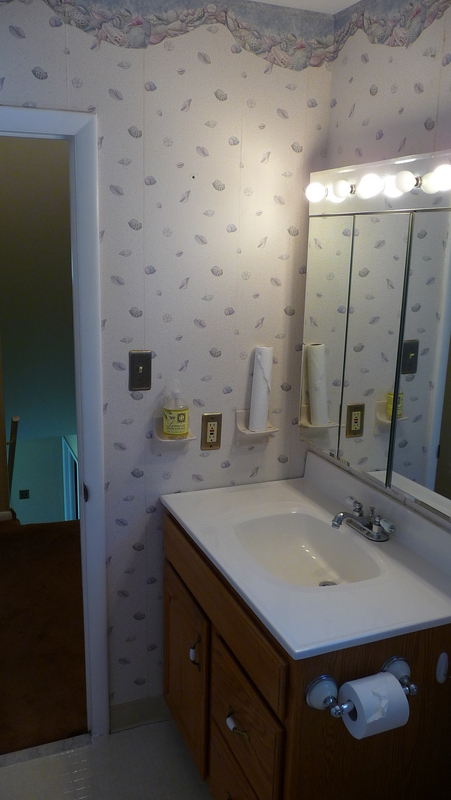 We paid our contractor to re-drywall and paint the whole bathroom. We were not pleased, but felt it was better to have something done once and done right! We had mold/water resistant drywall put in to be safer. I was going to put a cool khaki color on the walls, but decided to use the very warm and brighter shade we used in the master. We chose a white vanity by Allen & Roth with a matching medicine cabinet that is tall with a large mirror (not to mention a ton of storage). We picked out a brushed nickel light fixture with an interesting swirled design. 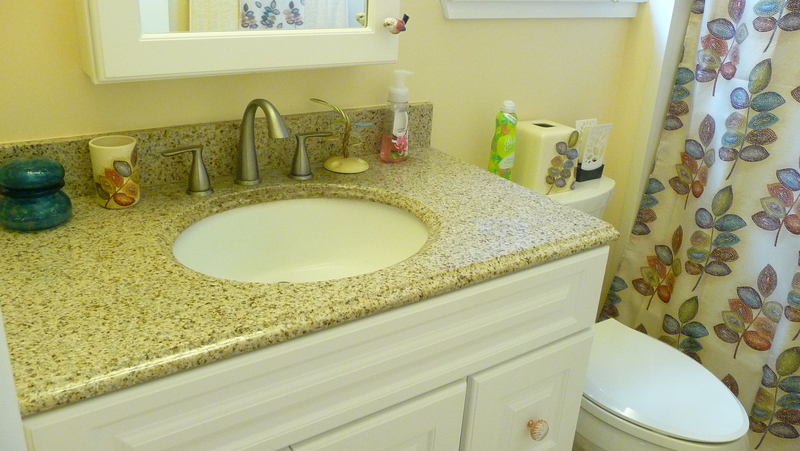 We found a granite color that we love for the vanity top to complete the look. After choosing brushed nickel finishings for the faucet and toilet paper holder/towel rack, I found some great knobs for $2.95 each at Anthropologie. All else came from Lowe’s. We just had the floor done with the porcelain tile that resembles wood, and our contractor made us a concrete/silestone room transition since a typical one wouldn’t fit (the room steps up from the hardwood in the hall). It looks like we laid driftwood in our bathroom, and the result is awesome! Neutral enough to keep indefinitely, even if we change out the decor colors in the future. 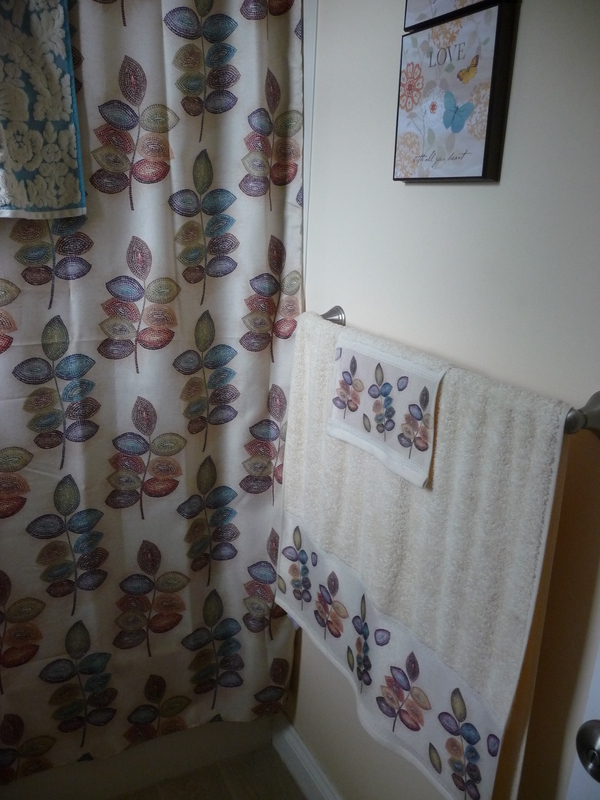 As for accessories, I fell in love with Croscill’s “mosaic leaves” collection, and got it all at Bed, Bath & Beyond with their 20% off coupons. 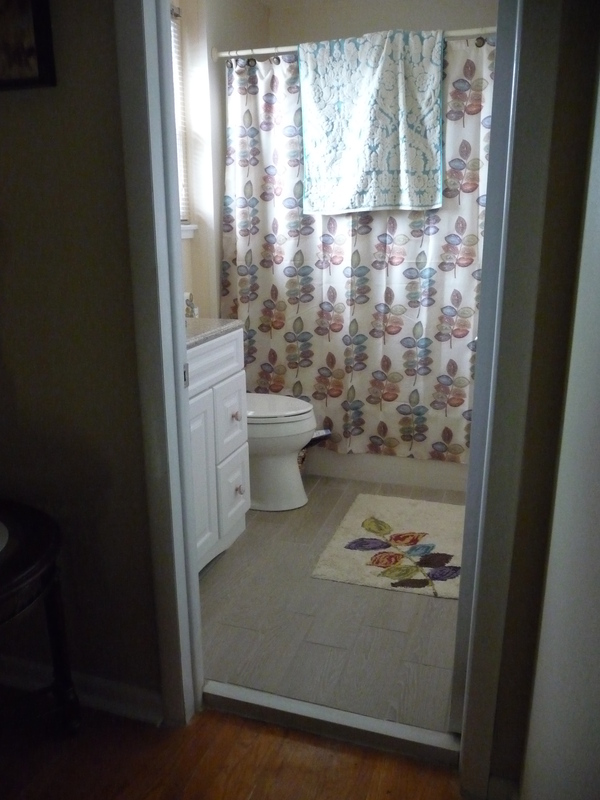 The result after the remodel is a bathroom that is warm, bright, fun, and really cheerful. It may be small, but it’s gorgeous and we enjoy it! 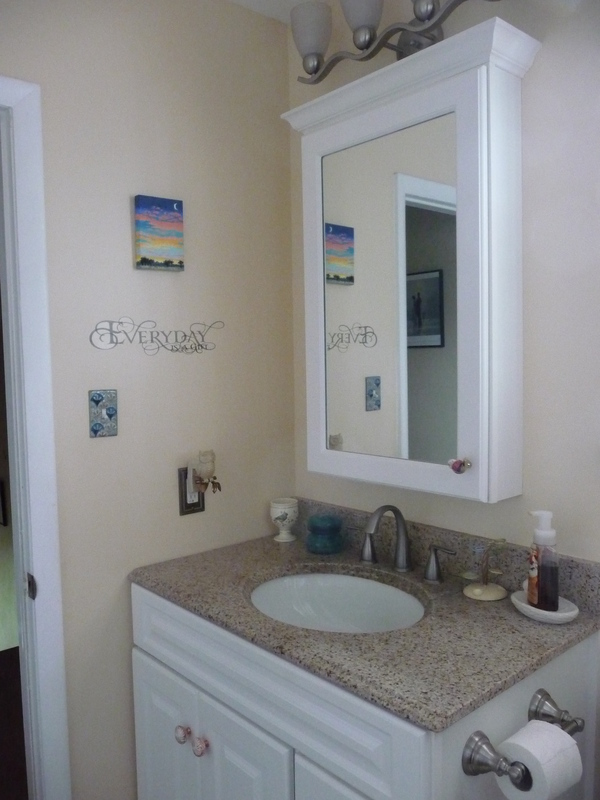 New vanity, granite top, medicine cabinet, and light fixture: $644 (yep, that’s the exact amount). 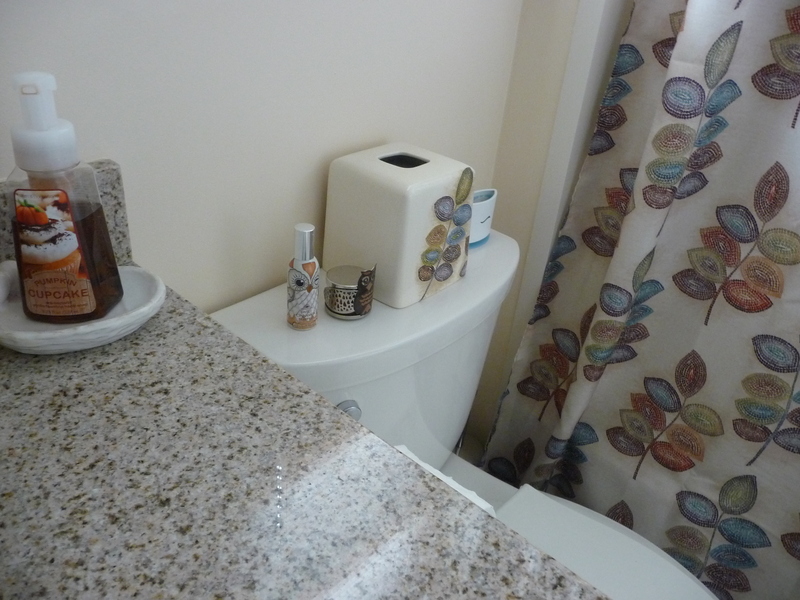 Bathroom accessories (including outlet covers, decal, painting, and wall art): $150. Grand total: $2,300 rounded up. Reblogged this on Antique and Vintage Toilets Central.